When you move around in the Finder, it’s easy to get confused about where you are. For example, you may navigate deep into a set of project archives and become unsure about which year or month you’re in. Two bars can help you figure out where you are and offer some shortcuts. The path bar is a slim strip, near the bottom of your Finder window, that shows where you are. (If you don’t see it, choose View: Show Path Bar.) The top level, at the left, will always show the drive (also known as a volume) where the window’s contents are located: your startup disk, a network volume or iDisk, or an external storage device. This is followed by arrows that show the full path to the currently selected item, with each subfolder and sub-subfolder represented. Move up the hierarchy at any time by double-clicking on a folder in the path bar. You can also use the path bar to move files to other locations in your hierarchy; just drag an item to a folder in the path. If your window is too narrow to display every folder name, move your mouse cursor over a folder in the path bar to display that folder’s name. A title bar is at the top of most program windows, and the Finder is no exception. Here you can see the name of the current folder, as well as that folder’s icon. Control-click on the icon, and a pop-up menu shows you the current folder’s full hierarchy as a stack of names. Select a different folder from the menu, and you’ll hop to that location. So, for example, if you’re in a subfolder of your Documents folder and you want to jump to your Home folder, just choose that folder from the title bar’s menu, and the Finder window will change to show the Home folder’s contents. 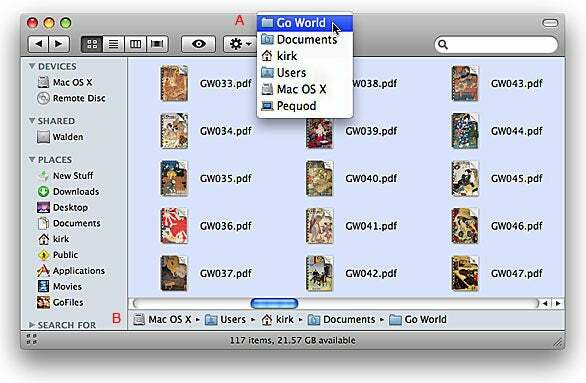 It’s possible to see the full path—for example /Users/kirk/Documents/Go World—in your Finder window title bars. The path appears without icons, and as a result can be more practical than the path bar for long paths. However, the path is useful only for figuring out where you are—you can’t use it to move to different folders or copy files to them. Alternatively, you can use Blacktree’s free Secrets preference pane. Once you’ve installed it, select the Show Full Path In Title Bar option in the Finder settings. Zip to other locations in the current file hierarchy by control-clicking on your Finder window's title-bar icon and choosing a folder from the menu that appears (A). Likewise, you can always see where you are by looking at the path bar (B).